Nothing brings excitement to a game table like a slithering, hissing, glowing-eyed reptile crouched atop a pile of treasure. But if the PCs aren’t high-level enough to survive a face-to-face encounter with a dragon, adding dragons to an adventure can be a challenge. No longer! 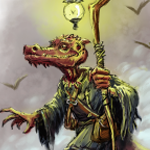 With the Book of Drakes you can unleash the most iconic monster in fantasy roleplaying on your players today. To whet your appetite, here’s one of our favorites: the Glass Drake (plus a special deal). This tiny creature glints in the light like a delicate figurine of blown glass given life. A sinister look on its face, the creature takes flight on transparent wings. Blinding Focus (Su) As a full round action the glass drake can distort its body to refocus light into a blinding display. Sighted creatures within 10 ft. must succeed on a DC 16 Fortitude save or be blinded for 1 minute. Those succeeding on this save are instead dazzled for 1 round. The save DC is Constitution-based. Breath Weapon (Su) A glass drake spits a line of shattered glass. These shards deal 4d4 piercing and slashing damage. In addition, creatures taking damage from the breath weapon also take 2 bleed damage. A DC 16 Reflex save halves this damage, including the bleed damage. Dynamic Death (Su) When reduced below 0 hit points, a glass drake explodes in a 10-foot burst of shattered glass. Any creature within range takes 8d4 piercing and slashing damage and 2 bleed damage. A DC 16 Reflex save halves this damage, including the bleed damage. Reform (Su) If a dead glass drake’s shattered remains stay within 10 ft. of each other, the drake reforms in 1d12 weeks. If even a handful of the shards are away from the rest, the creature will not reform. Each time a glass drake reforms in this manner it gains 1 negative level. Despite their size and delicate look, glass drakes are durable and vicious creatures prone to manipulation and cruelty. They prefer to make their homes in cities of industry and education where they can sell their services and information to artisans and those studying arcane arts. These drakes play on the perception of their fragile nature so others underestimate them. They often twist other’s words or blackmail people into service. Glass drakes live extremely long lives. If they live to an old age without ever having used their reform ability, their appearance begins to change. The creature’s scales lose their luster and become cloudy. Their features begin to sag and lose definition. When glass drakes are killed and their reform ability draws their body back together, it revives their body to a prime young physique. Because of this, glass drakes aggressively throw themselves into fights, especially in isolated areas or their home den where it is less likely to have their shattered remains disturbed. Some glass drakes enter into murder pacts with one another, where they take turns destroying each other and looking after the remains while the creature reforms. These pacts allow the drakes to slow the passing of time on their bodies and also create a bond of friendship between the two drakes. 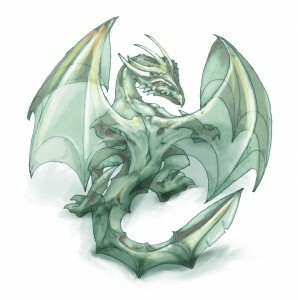 Since the glass drake’s method of reproduction involves the mixing of shards from two different drakes, this bond usually grows to include an immature glass drake, which almost immediately joins its parents on forays for the glass providing this drake’s primary food source. Glass drakes measure just over 18 inches from their sculpted snout to their thin tail, and weigh about 15 pounds. Glass drakes’ scales are extremely smooth and their hide twists the light to make the creature seem almost translucent. This is most prevalent in the glass drake’s wings and connective folds of skin. The creature’s teeth are as clear as the rest of its body. Glass drakes are material drakes. Want to see more drakes, large and small? Pick up the Book of Drakes today. The PDF version is just $4.95 for a very limited time! 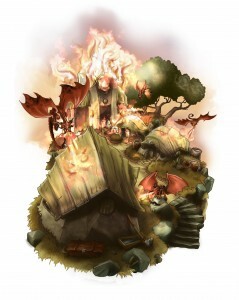 Sounds great but will we D&D 4E player’s get a translation of the tome useful in our worlds? 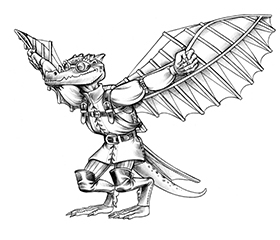 Open Design has done many dual-stat projects in the past, but honestly Book of Drakes has to be a success as a Pathfinder book before I’d consider a conversion. Will there be a hard-back? The pagecount isn’t in that 128+ page range where a hardback really makes sense. Adam, Mike, Wolfgang… this book looks dracolicious. So, if not hardback, at least in print? Happy to oblige: Available in print right now. Will there be an edition bound in rattlesnake hide for World of Synnibarr? Book arrived today. It’s awesome. I’ll add my interest as a 4e player. Won’t buy it any other way. Don’t own Pathfinder. Draco, good to know! We’ll see how it does in its current form, then make some kind of call. There are, of course, 4E-only projects like Logan Bonner’s Lost City adventure that have Pathfinder fans asking for a conversion, so… Can’t please everyone all the time.